in ALL caps: That French sound still sounds good! So the French sound seems to have permeated the airwaves again! Justice came practically out of nowhere to become the new French electronica darlings, a la Daft Punk. Well, the sound isn't limited to people born in France. You can ask our wonderful blog owner himself how much of the stuff I used to play while DJing! And I actually still have quite a bit of it lying around, too! May have to update you all with some slick French house one of these weeks! Well, today, the post is dedicated to that heavily filtered sound and a band that's beginning to make a few waves. 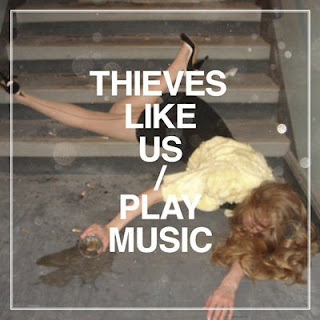 They're Thieves Like Us, and they just recently released their first full-length album, called Play Music. The best way to describe the sound will need some explanation. The band's name is the title of an old New Order track. So it's no real surprise that the sound seems to meld some elements of New Order with the French House sound - albeit at a lower BPM, many times. The result is a sound that just sounds calming, yet makes you want to dance a bit. The single making a lot of noise right now is the second cut off of Play Music, titled "Drugs In My Body". Along with the original, I've also included a remix done by a a duo of...well....sort of strange dudes that go by the name of Designer Drugs. I can't knock strange. I am, also. It's more fun that way, anyhow. And there's even a video for such a wonderful tune! Check it out! And for those who - for some reason unknown - haven't been exposed to the Daft Punk I knew and loved back in 1996? Here are two tunes. It was off of their landmark album Homework, which still gets love from many out there, and rightfully so! And if you are also up for a little house music on the deeper and more soulful edge? A friend of mine who I've known for right around 12 years now here in Boston has a site that's dedicated to house music in it's most pure form. DJ Bruno has been doing his thing here in Boston for twenty years, and I owe a lot to him, to be honest! So if you get a second, please make a visit to Utopia Boston Radio! If you're ever in Boston? Please do send me an e-mail. As you can see from all of us, music is our lifeblood, and we love to share! One final note! I am still digging through some contributions. I will be doing many of these in the final two blogs this months, as a sort of round-up of what to look for in 2009! So thank you for your patience! And please, shell out those duckets! Buy a little of the aforementioned music, so these guys can keep bringing you more of the good stuff!